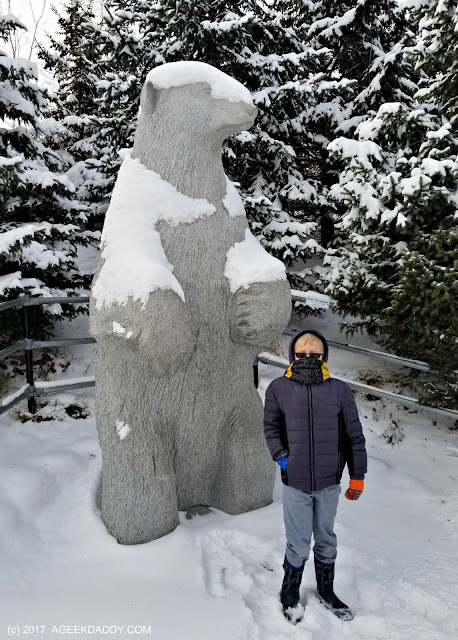 With the holiday still on our minds, my family went on a trek to the North Pole the day after Christmas. Well the closest experience possible to a North Pole adventure without actually leaving town that is. 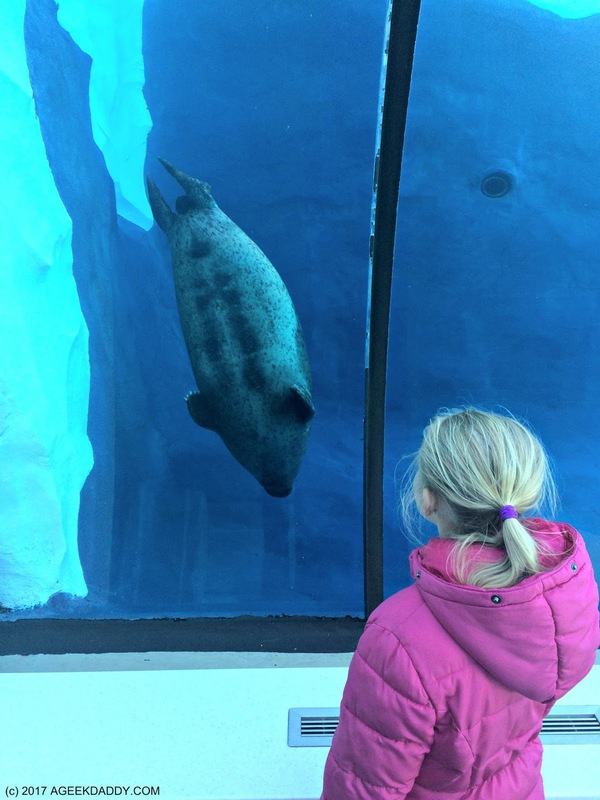 We visited the Detroit Zoo's Arctic Ring of Life exhibit. We didn't come across Santa Claus during our snowy hike but we did see a playful polar bear, white furred arctic foxes, and some blubbery seals. 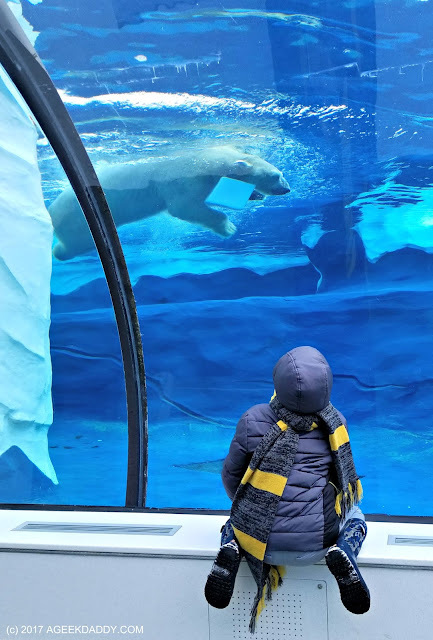 Visitors to the Arctic Ring of Life wander through a 4 acre outdoor and indoor exhibit space that is one of the largest polar bear exhibits in a North American zoo. 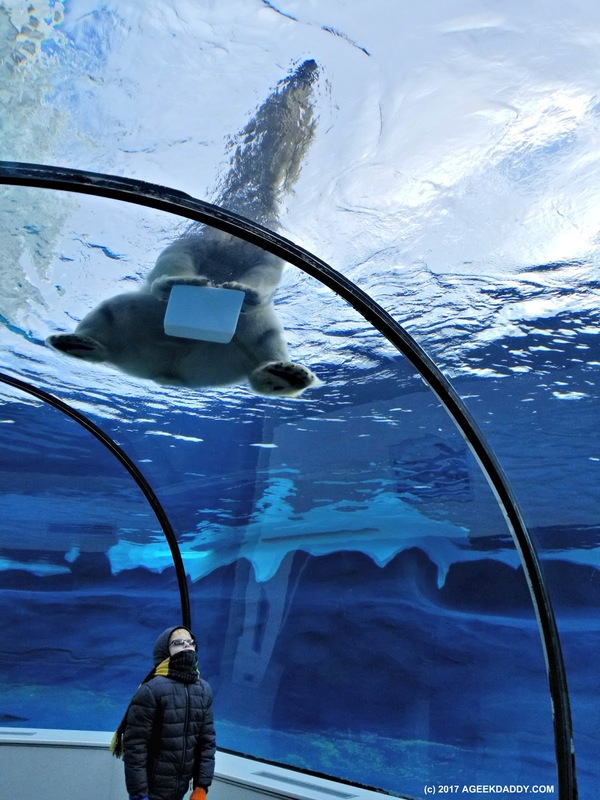 It is home to two 13-year-old polar bears, a female named Talini and a male named Nuka. The Detroit Zoo's polar bear habitat includes grassy tundra spaces, an area that replicates pack ice, a freshwater pond that is visible from an outdoor trail and a 190,000 gallon salt water pool that provides indoor viewing spots. You enter the exhibit walking across an outdoor trail that has placards along it with information about the Inuit way of life. Inuit are the indigenous people who have inhabited the Arctic regions of Alaska, Canada, Greenland and Russian Siberia. Replicas of Inuit artwork, inuksuk landmarks, and structures line your path as you keep an eye out for polar bears. 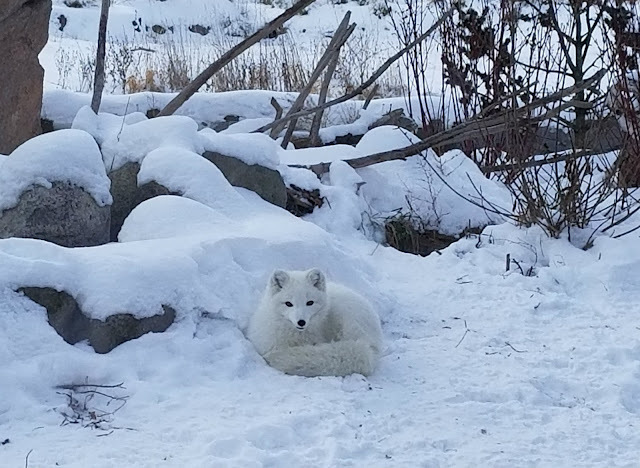 If lucky, the first thing you'll see is one of the arctic foxes that have their own habitat near the entrance to the exhibit. It is home to three female arctic foxes, Alex, Roxanne and Moxie. They can be hard to spot at times though because during the warm weather months their fur is brownish-gray blending into their tundra habitat but in the winter they have furry white coats that are great camouflage in the snow. We actually spotted all three as we walked along the path by their exhibit with one of them running over to check us out. As we passed the arctic foxes the next spot we approached was an outdoor observation point that provides a view of the tundra space where the polar bears are often wandering and the freshwater pond where you'll often see them swimming. No polar bears to be seen today but the pond was filled with hundreds of ducks which in it self was an impressive site to take in. As we headed out of the observation spot, a huge turkey vulture swooped down flying just a foot or so over our heads as it headed for some nearby underbrush where a chipmunk was running for its life. Next it was off to the indoor portion of the exhibit. The 70-foot-long Frederick and Barbara Erb Polar Passage takes you through a 12-foot-wide by 8-foot-tall tunnel that goes underwater through a giant saltwater pool that has seals on one side of it and polar bears on the other. It looks like they are in one pool but there is a transparent barrier between the two. 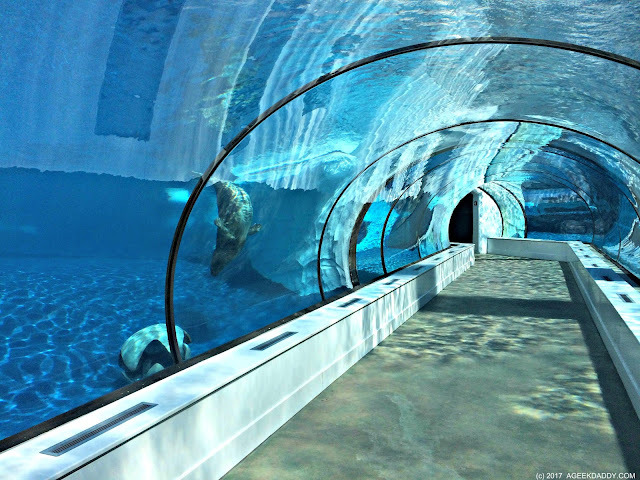 This pool is home to four rescued seals. Three gray seals (Jersey, Georgia, and Kiinaq) and a harbor seal (Sidney). 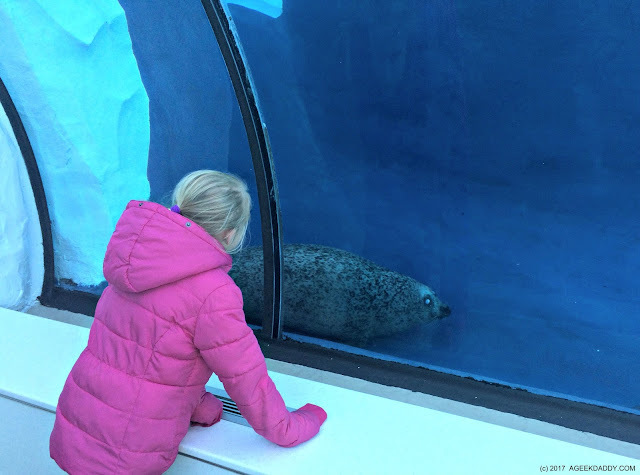 As you walk through the underwater passage it is possible to get up close views of these seals as they swim alongside and above you. This is a nice spot to sit awhile and just enjoy watching the seals swim about. 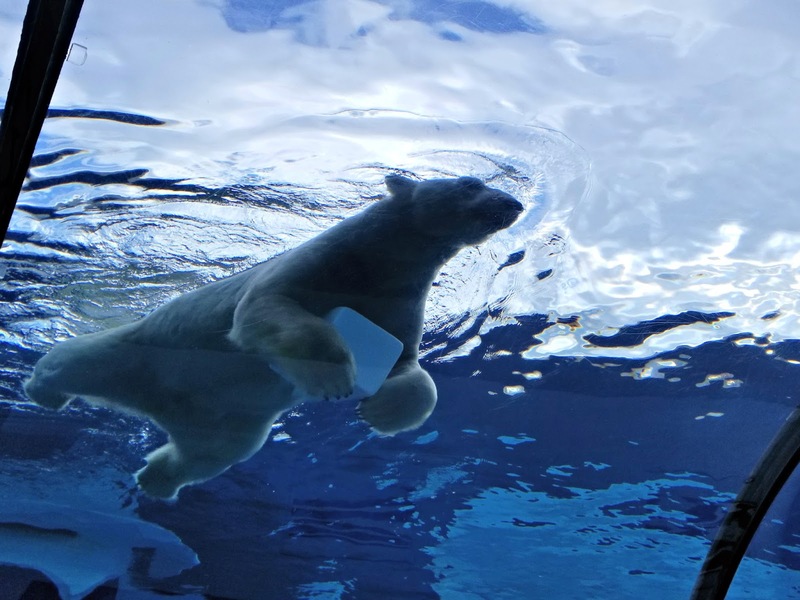 Sometimes you'll get a real treat and one of the zoo's polar bears will jump in the water too! During our visit, Nuka was having a lot of fun playing with his favorite toy, a plastic ice cube, and it was a thrill to watch him. Getting a close up view of a polar bear is an amazing experience. Wow are those paws huge! In fact, these are some big animals overall that can range from six to nine feet tall and weigh 450 to 1,400 pounds. Nuka looked so friendly my kids exclaimed they wanted to give him a hug, that is a big no-no though as polar bears are some vicious carnivores. 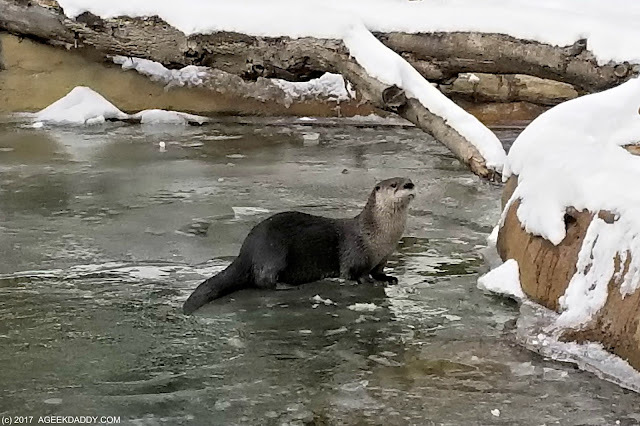 They are really great to look at when you aren't in danger of being their next meal and we spent a good amount of time watching Nuka playing with his toy in the pool as he walked above us on the roof of the tunnel and swam throughout the pool. Our up close encounter with a polar bear made a trip to the zoo on a frigid winter day well worth the effort and discomfort of the cold weather. The snow on the ground also made it seem as if we were taking a trek to the North Pole. 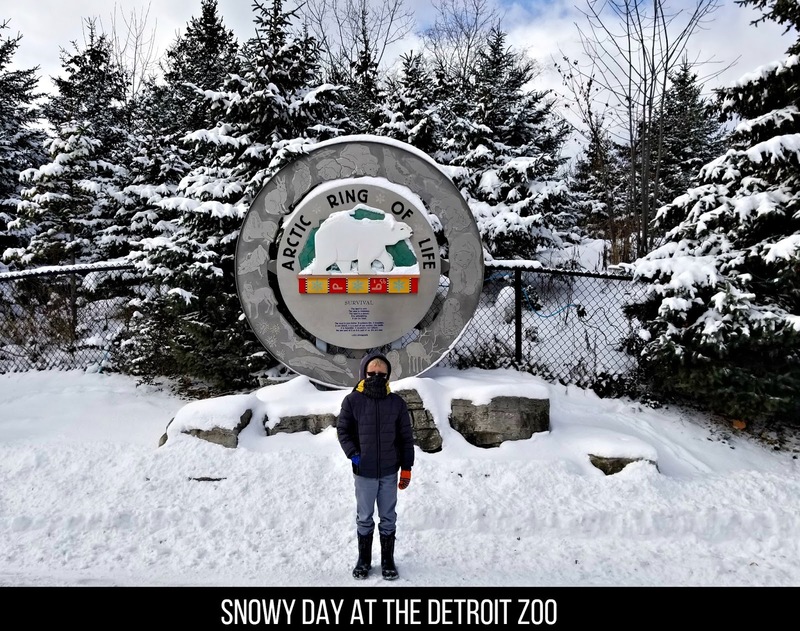 Plus we practically had the place to our selves ... there were no crowds to be found on this snowy day at the Detroit Zoo. As we left the Arctic Ring of Life heading back to our car, otters racing around their habitat caught our eye. The cold weather wasn't going to keep them from having a good time! They were sliding across their ice covered stream, swimming in and out of the water, and rolling around in the snow. Before we knew it a half hour had passed as we stood around watching the otters frolic. 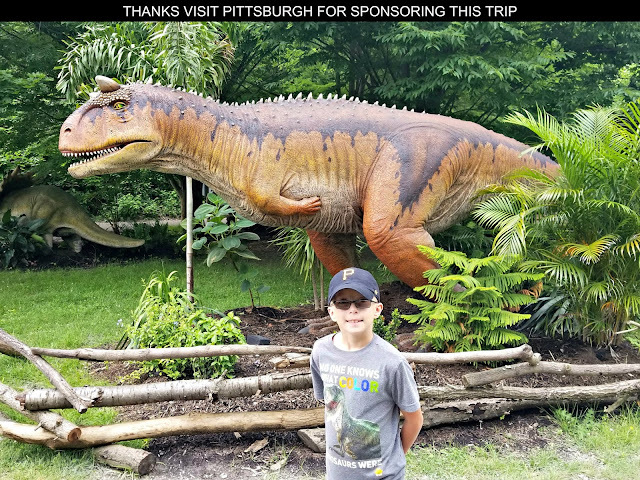 It was a good day to be at the zoo!